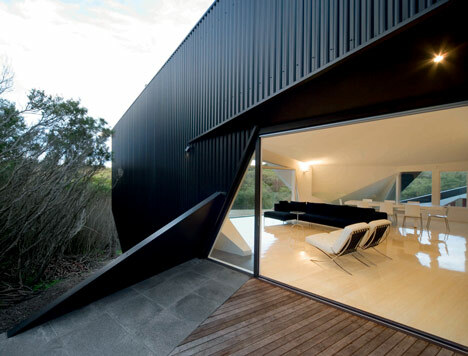 By passing the spiral back through itself the house has become the mathematical concept of the Klein Bottle . The house revolves around a central courtyard, a grand regal stair connecting all the levels. There is a sense of both being near and far too all occupants. 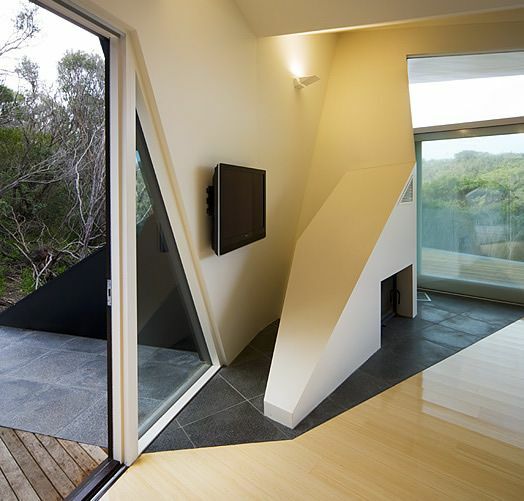 The ‘contents’ of the ‘bottle’ are a rectilinear platform and walls which make the abstract geometry inhabitable. The architects wanted a building that nestled within the tree line, that talked about journey and the playfulness of holiday time. What began as a spiral or shell like building developed into a more complex spiral, the Klein Bottle. It is easier than ever to ‘think outside the box’ for architects these days. With the use of technology (CAD), it is now easier to efficiently describe more complex shapes and spaces and communicate these to the build. In mathematics, the Klein bottle is a certain non-orientable surface, i.e., a surface (a two-dimensional manifold) with no distinct “inner” and “outer” sides. 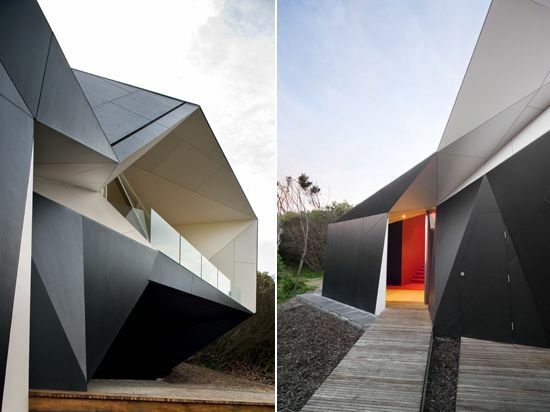 Klein Bottle House in Mornington Peninsula, Australia, designed by McBride Charles Ryan (MCR) applies the logic of the Klein Bottle, by being a shape which folds into itself to become one continuous volume. 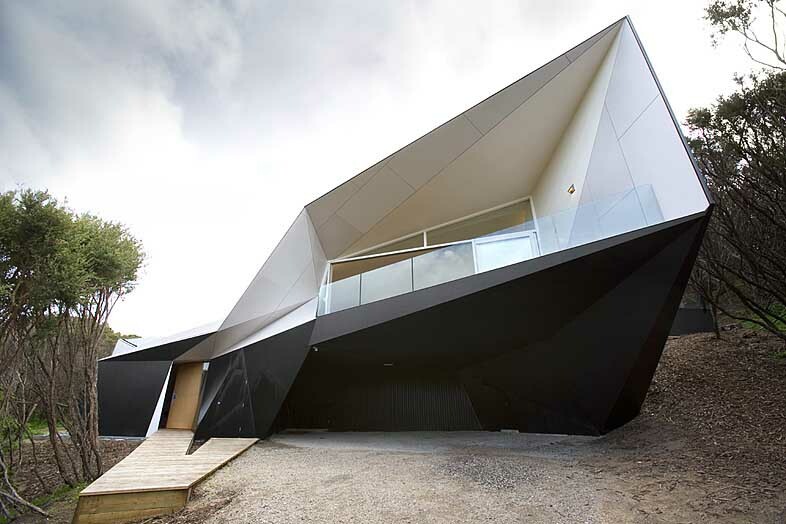 This holiday house is situated on the Mornington Peninsula 1.5 hrs drive from Melbourne. It is located within the tee-tree on the sand dunes, a short distance from the wild 16 beach. The Klein bottle, was first described in 1882 by the German mathematician Felix Klein, is a closed non-orientable surface, that has no inside or outside, is closed and has no border and neither an enclosed interior nor exterior. Its endless, curling shell-like quality particularly in the tee tree brings about a comforting togetherness. It is located on the Mornington Peninsula 1.5 hrs drive from Melbourne, within the tee-tree on the sand dunes, a short distance from the wild 16 beach. 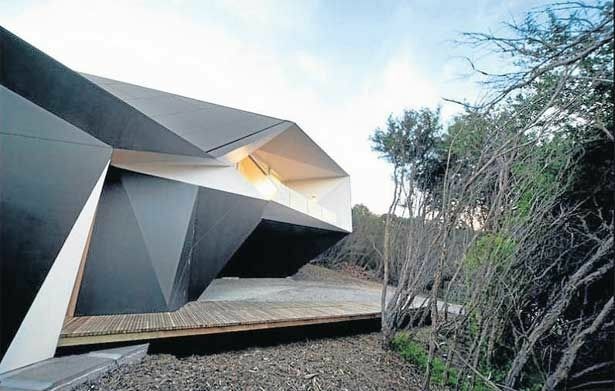 This holiday house is situated on the Mornington Peninsula 1.5 hrs drive from Melbourne. It is located within the tee-tree on the sand dunes, a short distance from the wild 16 beach. From theoutset MCR wanted a building that nestled within the tree line. That talked about journey and the playfulness of holiday time. What began as a spiral or shell like building developed into a more complex spiral, the Klein bottle. MCR were keen to be topologically true to the Klein bottle but it had to function as a home. We thought an origami version of the bottle would be achievable and hold some ironic fascination. 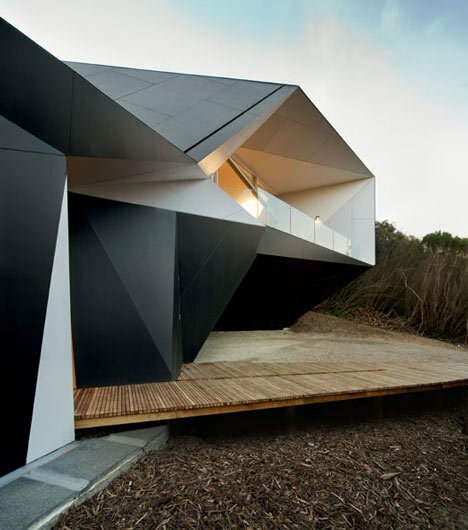 (The resulting FC version also has a comforting relationship to the tradition of the Aussie cement sheet beach house). Its spiral configuration is a spatial device which responds to the difficult topography, it is also a figure rich in coastal allusions. 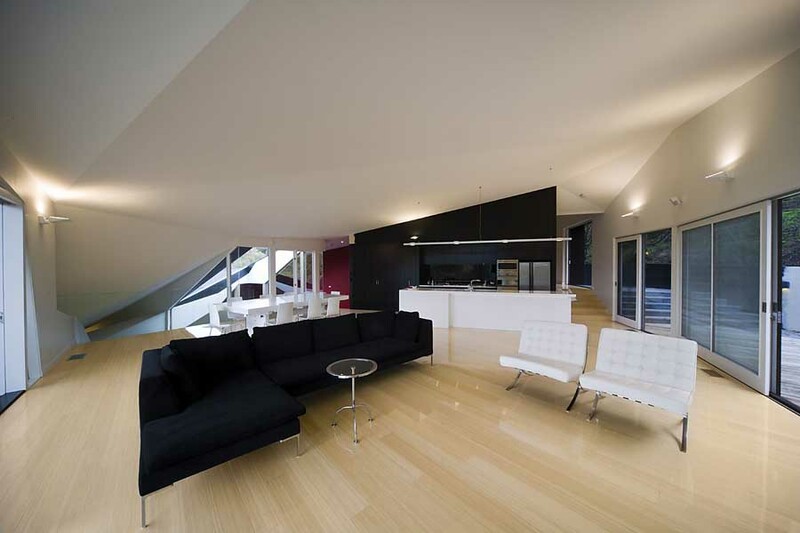 “This weekend house is located on heavily ti-treed sand hills adjacent the ocean beach in Rye . Its endless, curling shell-like quality particularly in the tee tree brings about a comforting togetherness..
Externally the building is predominantly clad in cement sheeting, simultaneously recalling both folded origami, tents and the ubiquitous ‘fibro-shack’. A dramatic stair winds around an internal courtyard picking up the bedrooms of the house as it ascends, the journey ending in the great living room. This strategy has unlocked a new series of relationships and sequential spatial experience. The building is supported on a traditional timber stud frame – pushed to its physical limit.” Desriptio by McBride Charles Ryan. 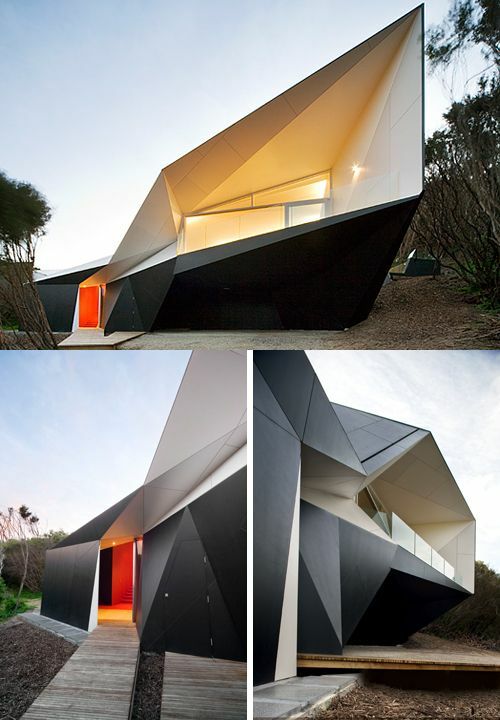 Cite: “Klein Bottle house / McBride Charles Ryan” 24 Oct 2008. 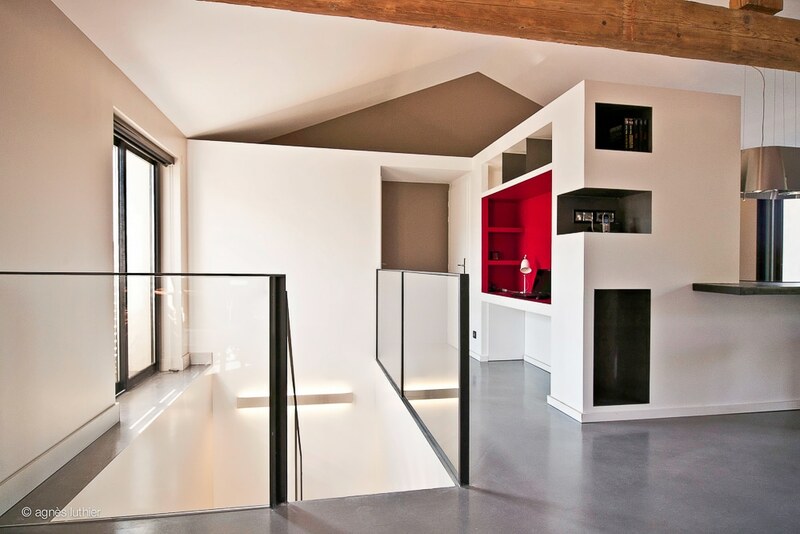 ArchDaily. Accessed . 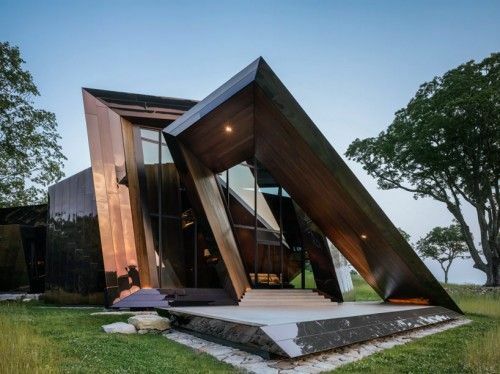 The building (we think) is also within that tradition of the use of an experimental geometry that could be adapted to more suitably meet contemporary needs, and desires. 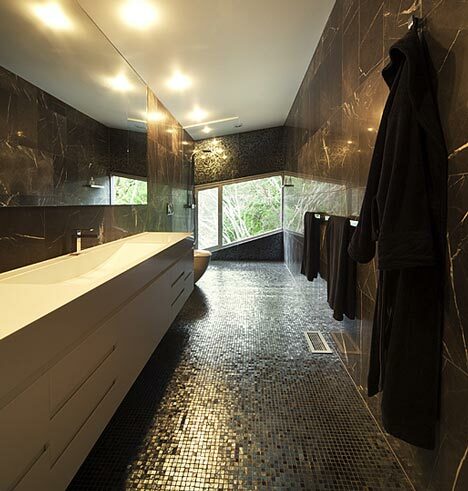 In that sense it is within the heroic tradition of invigorating the very nature of the home, most notable of this tradition would be the great experimental heroic houses by Melbourne architects in the 50’s (McIntyre and Boyd in particular). Text description provided by the architects. The Klein bottle is a descriptive model of a surface developed by topological mathematicians. 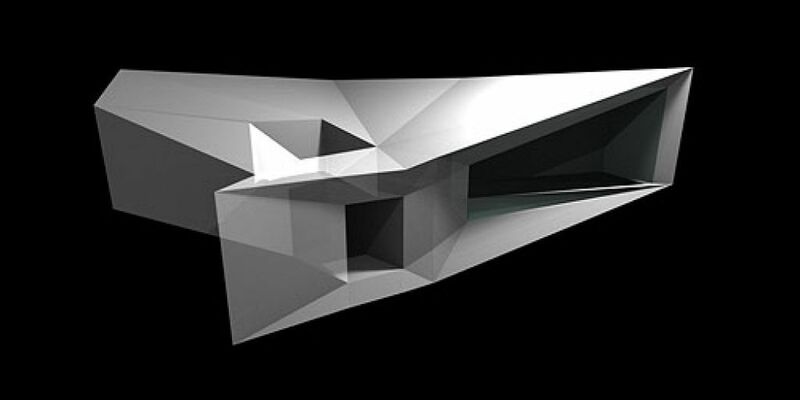 Klein bottle, mobius strips, boy surfaces, unique surfaces that while they may be distorted remain topologically the same. I.e. a donut will remain topologically a donut if you twist and distort it, it will only change topologically if it is cut. It can be constructed by gluing both pairs of opposite edges of a rectangle together giving one pair a half-twist, but can be physically realized only in four dimensions, since it must pass through itself without the presence of a hole.